Whether you’re building or renovating a home or an economy, you need to know how to find a good tradie. Where to start? The latest figures from the National Centre for Vocational Education and Research (NCVER) show a 10% fall in WA of young people starting apprenticeships in trade areas from 2010 to 2011. Dig a bit deeper and we see that we’re failing to train in some critical high skill areas. Automotive and Engineering training rates fell from 15.7 per cent in 2007 to 12.9 in 2011 and in Construction from 11.1 to 9.0 per cent. Taken together this is a decline in WA of 2,300 apprentices and trainees in these traditional trades. 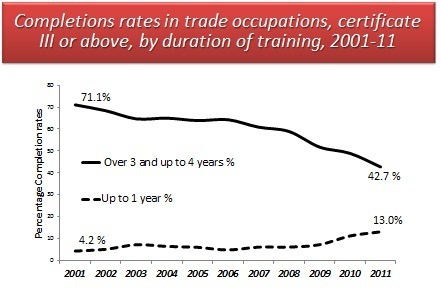 The critical mass in our training system - for training providers, employers, trainees and apprentices - has shifted towards high volumes of training at lower skill levels over shorter durations (see chart below). In short, we’re dumbing down our vocational training. It’s not just numbers and duration that matters, but also the quality of training. Since coming to office the Barnett Government has cut funding to TAFE colleges by $50 million (Parliamentary Question on Notice LC 6330). This funding has instead been directed to non-government and for-profit training providers. And the Barnett Government has plans it won’t reveal for further privatisation of vocational training. A radical experiment along these lines in Victoria has caused great damage (see the TAFE4ALLWA campaign). Of course we need a skilled workforce for more than just finding a tradie for your car or home repairs. It is essential for creating skilled jobs into the future. We do need University-educated engineering, health, education and other service professionals as well as trained service staff. But to build a strong economy that can cope with a changing future, we need on a broad mix of high-level skills. Professor Dani Rodrik from the Department of International Political Economy at Harvard University, argues that: “Without a vibrant manufacturing base, societies tend to divide between rich and poor – those who have access to steady, well-paying jobs, and those whose jobs are less secure and lives more precarious.” The recent Manufacturing Taskforce noted succinctly: “When a manufacturing plant opens, it attracts local services. When a supermarket opens, it doesn’t attract a manufacturing plant.” At present the economy in WA has been distorted to meet the short term needs of just one sector, the resources sector. When industry and unions lobbied to advance the Skilled Jobs (Benefits from the Boom) Bill 2012 to require resource companies to account for the amount of local content in meeting their supply needs as well as their delivery on workforce training, the Barnett Government rejected that Bill. When a national manufacturing jobs summit was held, Barnett didn’t bother to attend. Ensure that apprentices are given fair wages and conditions. Make resource companies accountable for training by supporting the Skilled Jobs (Benefits from the Boom) Bill 2012. Oh, and if we do these things, it’ll also be cheaper and easier to finish that home renovation project.